I’ve been on a painting jag lately which has been great for my visual arts side of things. I was just in the Wine and Art Walk and I will soon be in the Anonymous Art Show at the Kariton Art Gallery. Then after that I am taking part in the Fraser Valley Biennale. It is shaping up to be a busy summer. 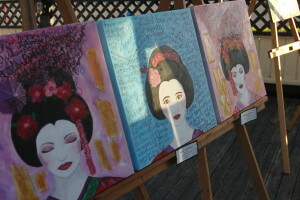 Most of my painting time this year has been focused on a collection I titled Geisha Girl Stereotype Survivor. 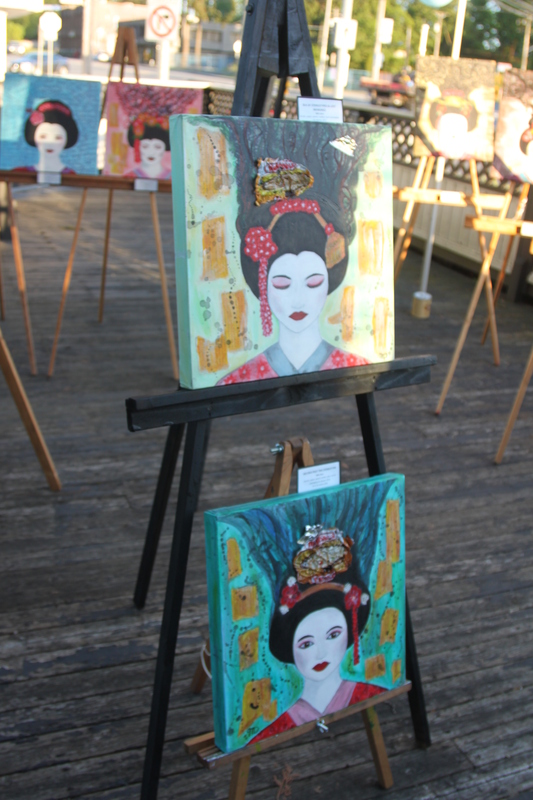 They are the works displayed in the Wine and Art Walk and to be displayed at the Fraser Valley Biennale. To learn more about my thinking around these paintings, check out my initial Artist Statement and Biography I used for my most recent show, the Wine and Art Walk. Miki Dare (Dare is a Japanese word, it’s pronounced DAH-RAY) uses acrylic paint and mixed media on canvas to depict the messy dichotomy of life. She is inspired by the flower growing out of a crack in the sidewalk and the muddy footprint on the freshly cleaned floor. It’s about being creative and surviving with love, strength and a sense of humor. My artwork explores the layers of who we are and what society says we should be. Our mental and media landscapes are littered with psychic fast-food garbage that smothers personal realities and histories. How do I stay true to myself, remember my roots and contend with institutional –isms? My art is the struggle between the ‘perfect’ stereotypical images and the reality of being a woman and Asian in Canada. It’s the interface between ugly truths and beautiful individuals who persevere. Wear garbage and graffiti with pride and creativity. Cherish the burnt canvas and torn pages of history. 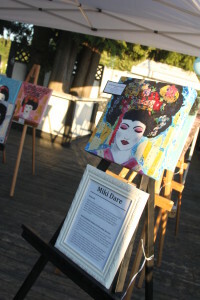 Be a geisha girl stereotype survivor.